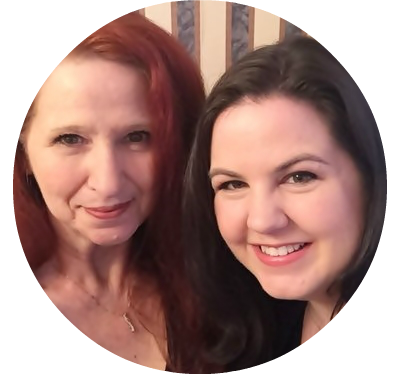 I can’t let St Patrick’s Day pass by without adding a little something green to the blog. 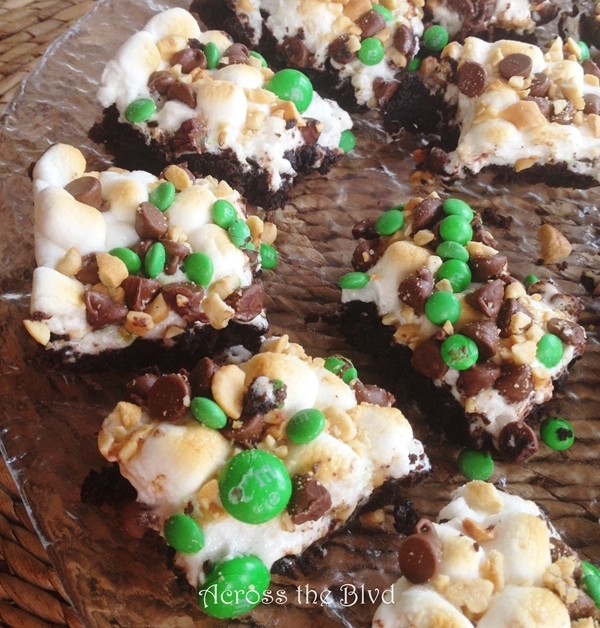 Gooey brownies with a marshmallow, cashew and mint M&Ms topping may be a little messy, but they are certainly worth it. The combination of flavors and textures makes this a delicious treat. I used a Duncan Hines Dark Chocolate Fudge Brownie mix as the base for this and then checked my pantry for toppings. My recipe was created based on what I had on hand. Follow directions on brownie mix box. Bake as directed. Once done, remove from oven and change oven setting to broil. Sprinkle marshmallows on top and return to oven. 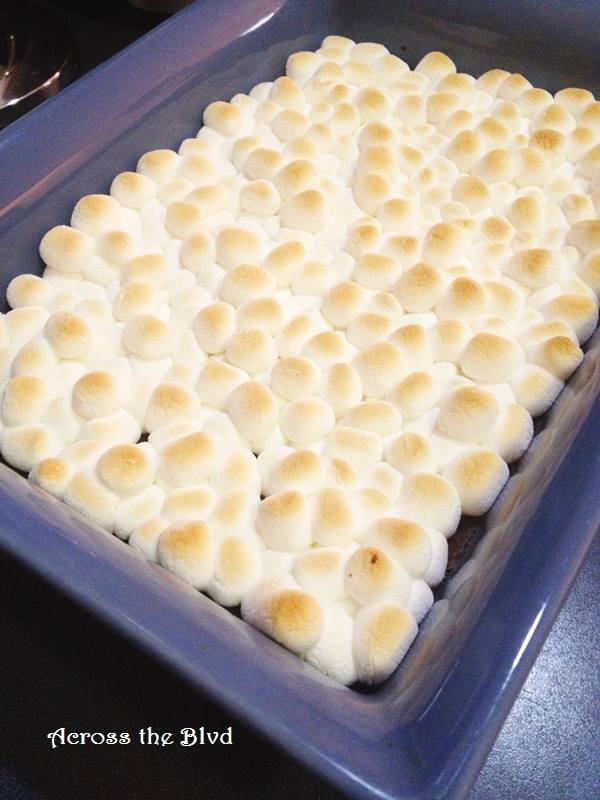 Remove from oven once the marshmallows have lightly browned. 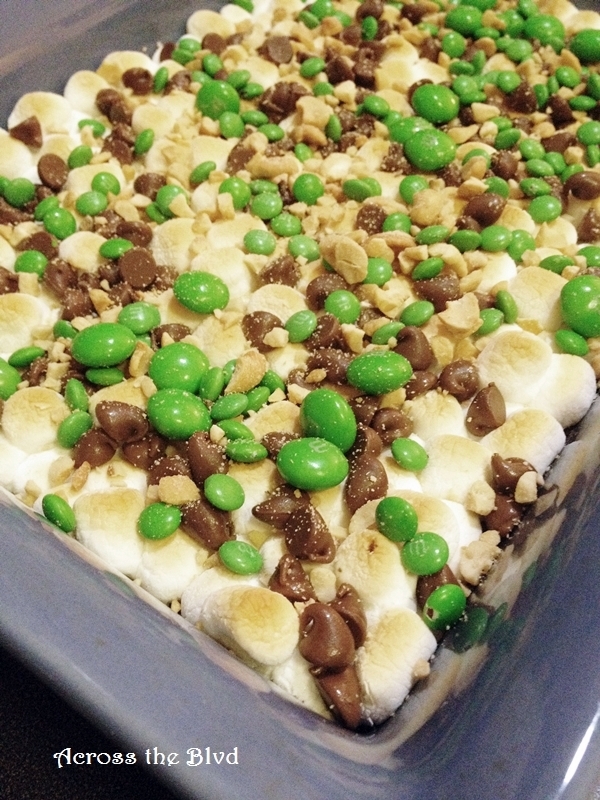 Immediately sprinkle the chocolate chips, nuts and M&Ms over the top. Allow to cool completely before cutting. Using a wet knife works great for cutting through the marshmallow. Just rinse it between each cut and you’ll avoid having a sticky knife blade. I used cashews because I had them, but pecans or walnuts would be great, too. 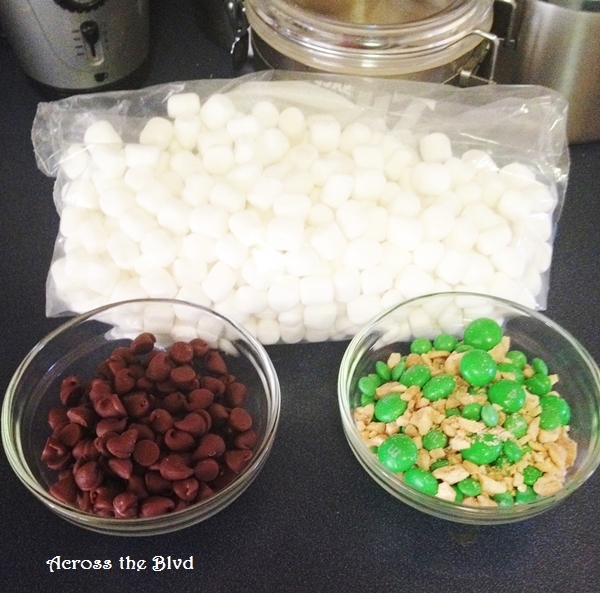 While the marshmallows are still warm, sprinkle chocolate chips, cashews and M&Ms on top. Allow to cool before slicing. Slice into squares and serve. Cover in tight container when storing. The mint M&Ms give just the right amount of mint flavor for me. 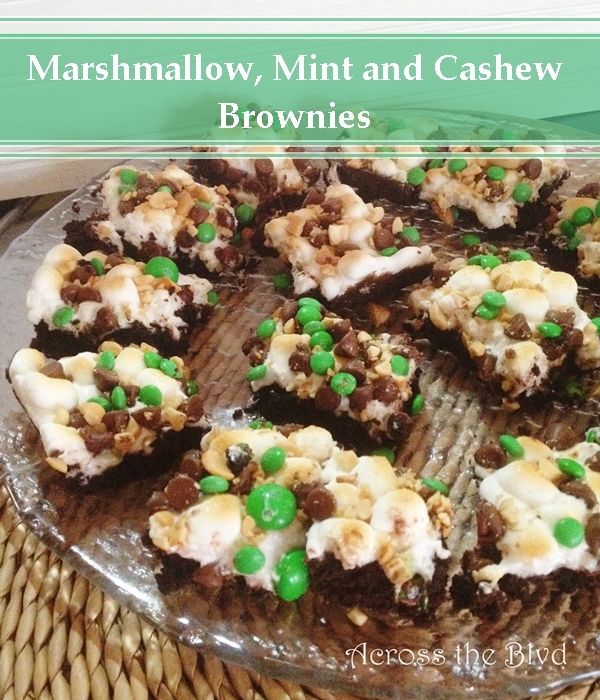 If you’re like me and you don’t mind using a box mix, this is a quick and easy delicious treat. Plus, it’s got green M&Ms so I’m all set for St. Patrick’s Day! These look wonderful! What a great treat for St. Patrick’s day! And they are easy!! Thanks, Laurie. Your brownies look amazing and I bet are delicious. Thanks for sharing the recipe to make them. Hope you had a nice St. Patricks Day. Hi Julie! They are pretty tasty! Thank you. Hope you’ve had a lovely day, too. These make me so hungry! Thanks for sharing your recipe. Glad you liked it, Sherry, thanks! Thanks! Those flavors do go well together! I hope you enjoy it! 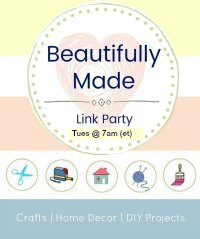 Popping over from Brag About It to thank you for linking up with us 🙂 Pinned and tweeted to share some more 🙂 I know my kids are going to love this! Have a great day Beverly! 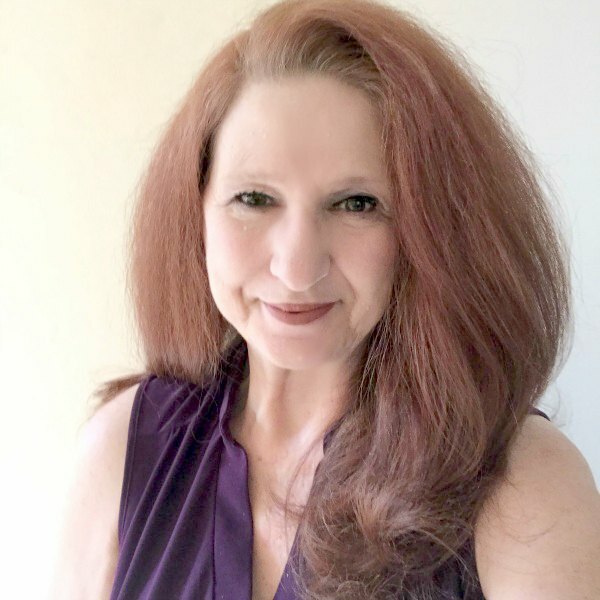 Thank you, Laurie and thanks so much for the shares! Thanks for a great party each week. 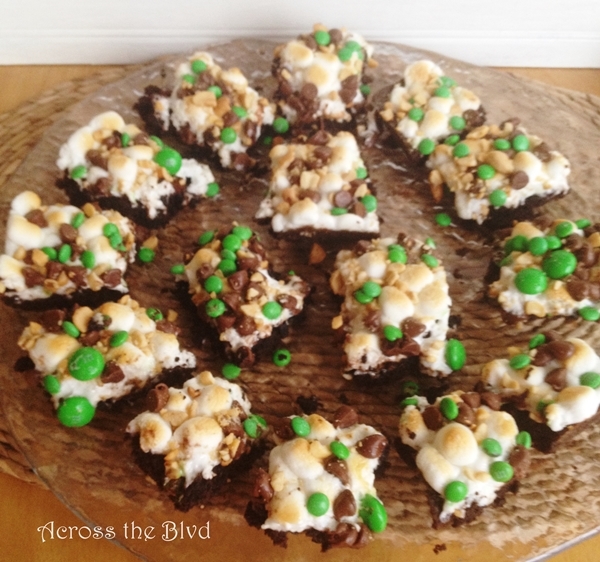 These look really tasty – and St. Patrick’s dayish!! Thanks for sharing on the “What’s for Dinner” linky! Thank you, Helen. Thanks for the party, too!